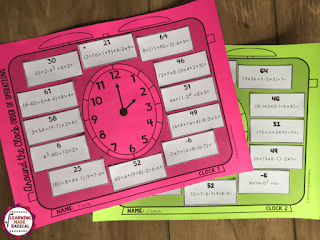 I find it so important for students to actually work with one another by communicating. We live in such a technology age that sometimes students, adults included forget how to actually communicate with one another. I can explain, show multiple examples and more for a new topic. But sometimes a student needs to see a topic in a different perspective. Students are great teachers too! I love creating activities that are hands on, self-checking, collaborative AND print ready! 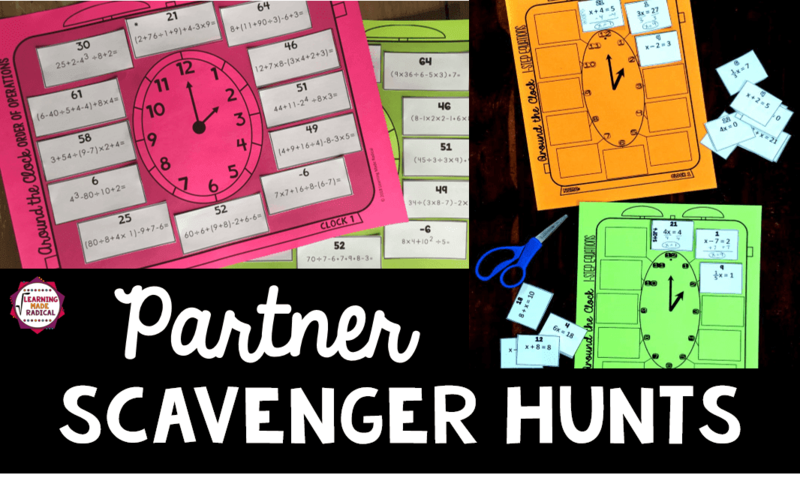 I teamed up with my friend Shana over at Scaffolded Math and Science and we worked together to create this FUN "Around the Clock Partner Scavenger Hunt" takes those activities and puts them all into one! 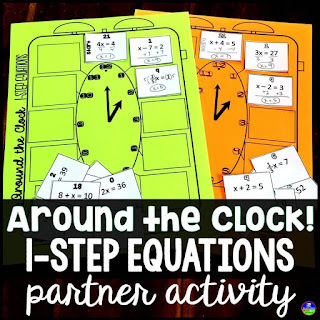 How do these amazing activities work? Each student in a pair gets their own clock and their own set of 12 problems. Each set of problems are different, but the answers will be the same. 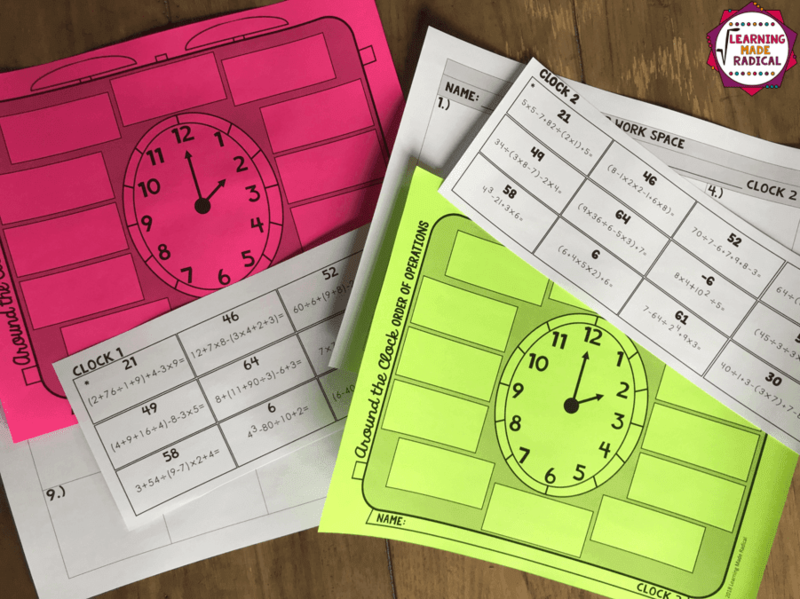 I printed the clocks on two different colored sheets. Have you tried Astrobrights? I love! Then the problems sets are printed on white paper. The sets are in different fonts. If needed, everything can be printed on white and the activity still works out great! Within the activity, there are two additional versions with detailed directions provided. There is a (*) on one problem from each set. Those problems are the starting point and are to be glued at the 12 o'clock spot. Then if using the provided blank answer work space page, I recommend having the students put that problem in the #12 space. Keep the problems with the same hour they are on, easy checking and referencing if needed. Both of these problems are different, but the answers are the same - 64.These answers will be found at the top of the problem cut outs. When the answer is found, that problem will be the next one in the scavenger hunt. That next problem will be put at the 1 o'clock spot. 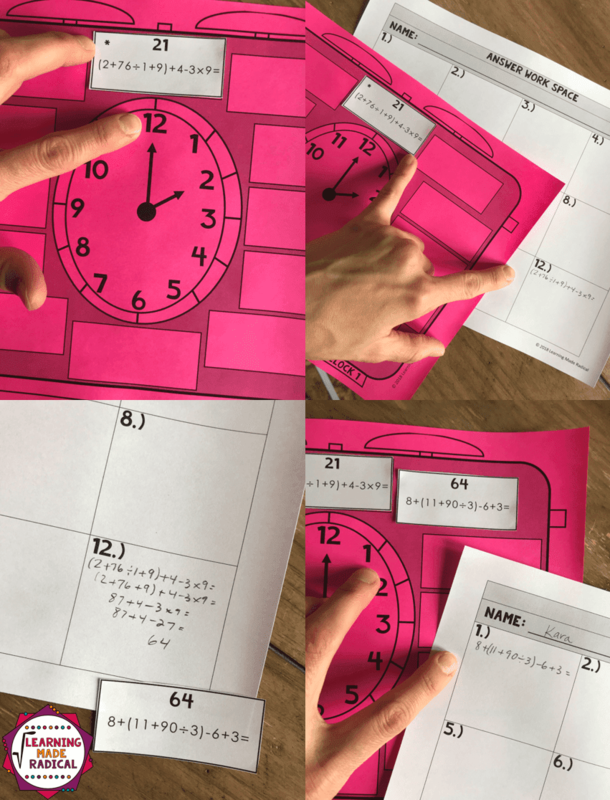 Each student works through their own set of problems, moving along clockwise. They can reach out to one another if they are stuck at any point or do not agree on an answer. They can help one another and find the correct answer that is the same between them. When they reach the 11 o'clock spot, that problems answer should match the answer at the 12 o'clock spot. 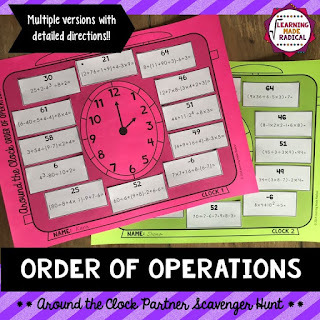 Check out my newest activity - Order of Operations (pictures seen above). 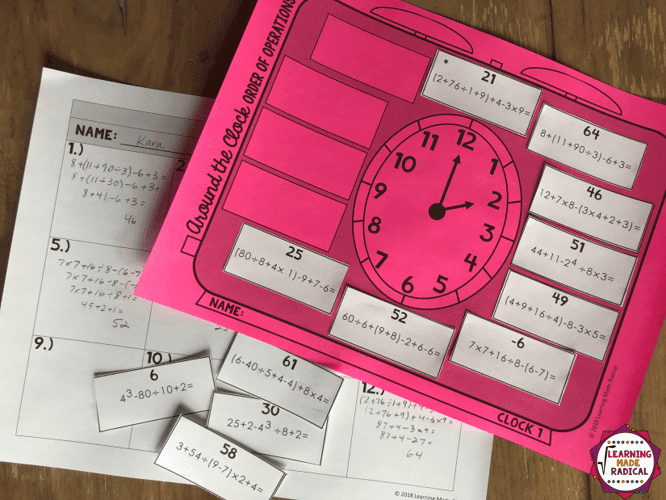 Shana made this Around the Clock activity for 1-Step Equations. It works exactly the same way as the above and covers 6.EE.B5. To read more about her activity and to see other tips about our Around the Clock activities, head on over to Shana's blog to read more - Partner Scavenger Hunt! 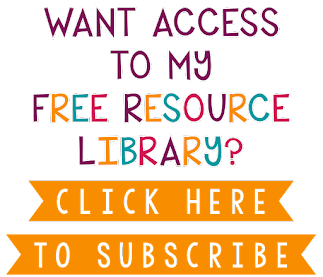 Very excited for this new activity and ready to create and bring more topics to you! Comment below or email me at kholland2007@gmail.com! 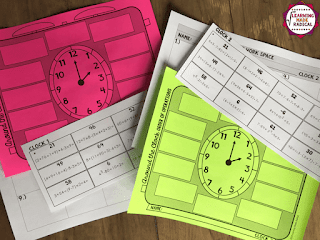 Do you make these around the clock scavenger hunts for upper elementary grades?